Fashion's Night Out this Friday! This Friday, September 10th, is going to be an absolute city-wide celebration of fashion with Fashion's Night Out. From Downtown Los Angeles...to 3rd Street in West Hollywood...to Abbot Kinney in Venice, store after store will be taking part in the party. Most places are including party favors like champagne, cocktails, massages, and manicures and all locations have an opportunity to win something fabulous. Doors will stay open late so that you can hit several stores over the course of the evening. Be sure to check out the link above for details on all the excitement and to plan your attack on Los Angeles. Created and curated by Scout's Joey Grana and vintage dealer extraordinaire Richard Wainwright, this finally promises to be an opportunity to see vintage in its best light. It's organized by people who love vintage, includes vendors who love vintage, and created for shoppers who love vintage. You can be sure that celebrities and celebrity stylists will be there for the fashion-forward finds. The event is also being held at the Cooper Design Space downtown, so you will finally see vintage displayed and sold in a proper setting. The opening night party with DJ and open bar kicks off at 6 PM and goes until 10 PM Friday. 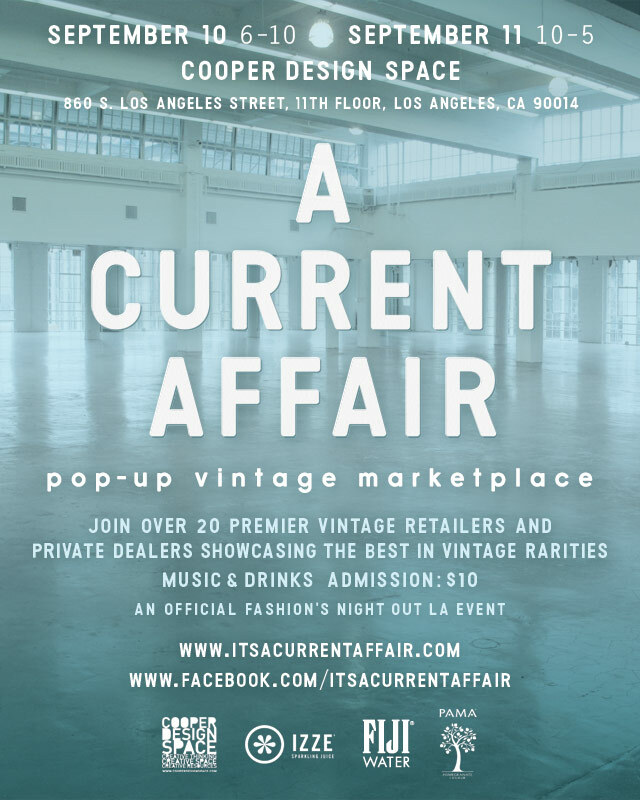 Bonus...unlike other stores in town, "A Current Affair" runs through Saturday, September 11, just in case your dance card gets too full with Friday night activities and shopping.